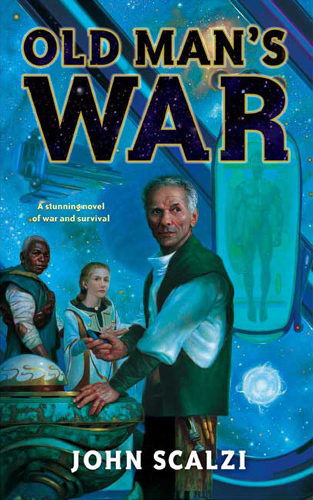 Old Man's War is a tremendous, confident SF debut for well-known blogger John Scalzi. Openly patterning itself after Starship Troopers, Old Man's War takes an exciting tale of alien conflict and dresses it up intelligently with such themes as individual identity, what makes one human, the significance of mortality, and the ethics of life extension. Economically told at just over 300 pages, the story, peopled with remarkably well-drawn and memorable characters, never flags for an instant and steers a steady course without veering into self-importance or maudlin sentiment. 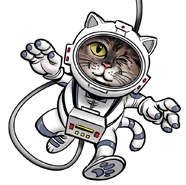 Its a top-drawer first novel that should put Scalzi high on your "Writers to Watch" list. Scalzi begins his tale by throwing the traditional military plot an ingenious twist. The Colonial Defense Forces, who serve and protect human colonies in distant space from an apparent infinitude of hostile alien races, have taken to recruiting seniors upon their 75th birthdays. Granting them youth through an astonishing life extension process, they thus have soldiers with an entire lifetime's experience and wisdom behind them. But the hard truth is that the universe is an intensely dangerous place. In Scalzi's future, nothing as benign as Star Trek's Federation could possibly exist. Aliens are alien; their cultures, morals, philosophies, and motives are often impenetrable, with only one fact entirely clear — that livable real estate in the universe is scarce, and numerous species will have to fight for it. The revivified soldiers of the CDF are told bluntly they will most likely die within three to ten years. But, they are told with equal bluntness, had they stayed home on Earth, old age would have killed them within the same time frame anyway. What could be cynicism in an author with a more overt political axe to grind (say, any one of the genre's two-fisted libertarians) is conveyed by Scalzi as pragmatism. Many readers might be morally troubled by the presumption that xenophobia would be the default position of virtually any sentient being. But, as some of the more idealistic characters are warned by the lucky (in that they're still around) veterans, out here, your preconceptions don't apply. Consider how, here today on our own sad Earth, we just can't seem to get along with our own species. Religious, racial, cultural and political ideologies cause thousands to kill thousands, and over what? A certain patch of land to call home? All Scalzi has done is translate this grim reality to a universal stage. How much worse could it be if two or more species utterly alien to one another come to blows for the same reasons humans have proven only too eager to slaughter one another over? War is easy. Peace, love, and understanding are hard work. Anyway, the synopsis: widower John Perry enlists, undergoing the aforementioned life extension. From the book's opening, Scalzi shows a gift for characterization, for allowing his characters to think, feel, act and talk like people you know. And for allowing his characters to be the voices through which his book's themes are communicated. Mortality, the specter of death, greets us from the opening page — the first scene is in a cemetery — and lingers with us throughout the story. But while it's never portrayed as a reason to succumb to depression or despair, our natural human resistance to the unfairness and capriciousness of death is given full vent. Perry deeply resents the suddenness of his wife's death — a stroke that comes without warning on a normal day — and, with unfair, sudden death all around us (9/11, the Iraq War, the 2004 tsunami), there's not a single reader who won't respond to the call to rage against the dying of the light. For Perry and the friends he makes among his fellow recruits, their new bodies are an opportunity for Scalzi to reimagine the coming-of-age theme that is a staple of all war stories. The CDF recruits get a chance to come-of-age again, and their rediscovery of youth is told with a warmth and humor impossible to resist. Scalzi also enjoys a bit of satire here — the "user's manual" Perry and the other recruits get with their new bodies is hilarious, as is the fact everyone gives their implanted brain/computer interface a nasty name — while simultaneously addressing, subtextually, some real concerns being voiced in transhumanist circles about possible future life extension technologies. In Old Man's War, only the CDF owns the technology to create these spiffy enhanced bodies, and their acquisition comes with a towering cost. If, in real life, such technologies are ever invented, will they be available to all, or a select few? Will they be accessible, or controlled by governments or corporations that will demand a price too high for most to pay? Enhanced or not, Perry and the rest of the novel's cast win you over effortlessly. It takes a book like this to make you realize how thin so many SF and fantasy novels — hell, how many novels period — are on character. In Old Man's War, the age-old theme of the brotherhood (here meant in a gender-neutral sense, of course) between soldiers is naturally put through its paces again. But with such strong heroes to root for, it's no effort at all to sit back and enjoy it. There's something that feels good about seeing a familiar storytelling trope done in a way that just works. The novel is told in a three-act structure common to screenplays. As the third act opens we are hit with a twist that I won't reveal, even though probably every other review you might read will. Suffice it to say that it's the sort of thing that most other writers would exploit as an excuse for easy feel-good sentiment, a way for the hero to avoid the inevitability of fate and dance off to a contrived happily-ever-after. And never mind following the rules you've set for your own story. (Think of the ending to the original, non-director's-cut version of Blade Runner.) Scalzi avoids these traps like the pro he is. Instead, he uses the concept of the Ghost Brigades as an opportunity to explore the meaning, and the importance, of identity, what it is within us that makes us human. Perry and his CDF companions have had their pasts preserved intact while being transferred into marvelous enhanced bodies; the Ghost Brigades have even better bodies but no pasts, and exactly what sort of human being (would it even be a human being?) this might develop is explored chillingly and convincingly. There are times when Scalzi overplays his hand. One character is allowed to do something spectacularly stupid so that his ghastly death can make a point about naïve idealism. There's literally no other reason for him to be so stupid, and from the minute you meet him, his obnoxiousness pretty much telegraphs his impending doom like a bullhorn. Also, there are times when the bizarre menagerie of alien foes the CDF encounters goes gleefully over the top, such as the Lilliputian inch-tall humanoids whose cities the CDF soldiers tromp through like Godzilla. But such infelicities are few. On the whole, Old Man's War is quintessential laugh-cry entertainment, a book whose warmth, wit, and overabundant humanity stay with you long after its last shot is fired. Followed by The Ghost Brigades.